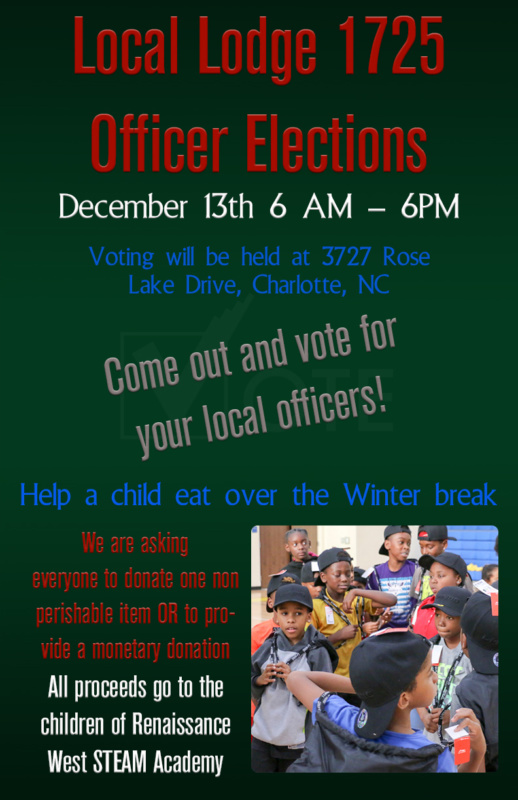 Reminder: Local Lodge Officer Elections are Dec 13th, 6am – 6pm! Mark your calendars and don’t forget to go to the Local Lodge and vote for your new Officers. 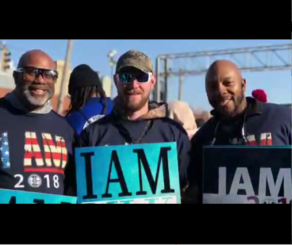 Voting will open at 6 A.M. and close at 6 P.M.
Don’t forget to bring a non-perishable canned food item or monetary donation for the children of Renaissance West STEAM Academy for help over their Winter Break. Your donation is greatly appreciated! Hello brothers and sisters, it’s that time again. We are looking for any monetary donation or non perishable food donation to take to the “Renaissance West STEAM Academy” for the Winter break. As some of you may not know, but some of the children go without through the holidays. So with your donations we will be helping to feed at least 10 homeless families while they are out of school for 2 weeks. No donation is too small any and all will help. 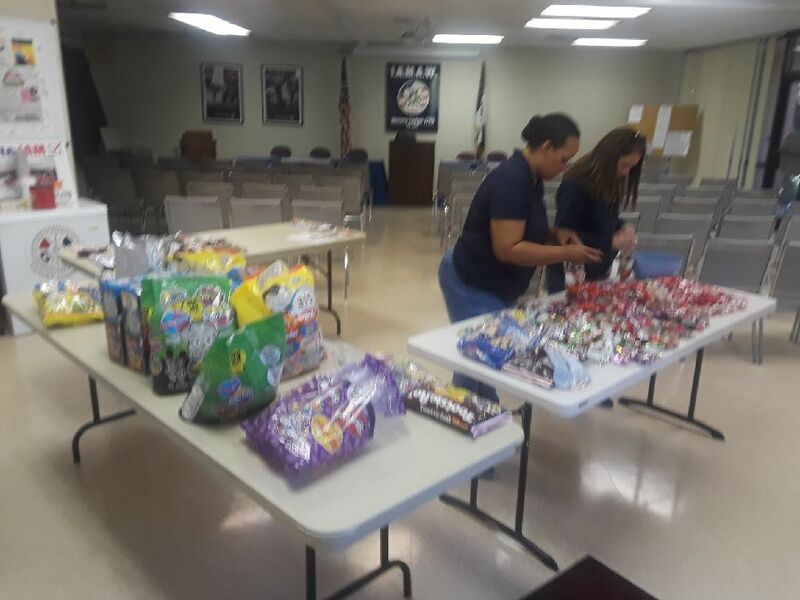 Candy Drive Update: Donations Still Needed Before Monday, October 29th! 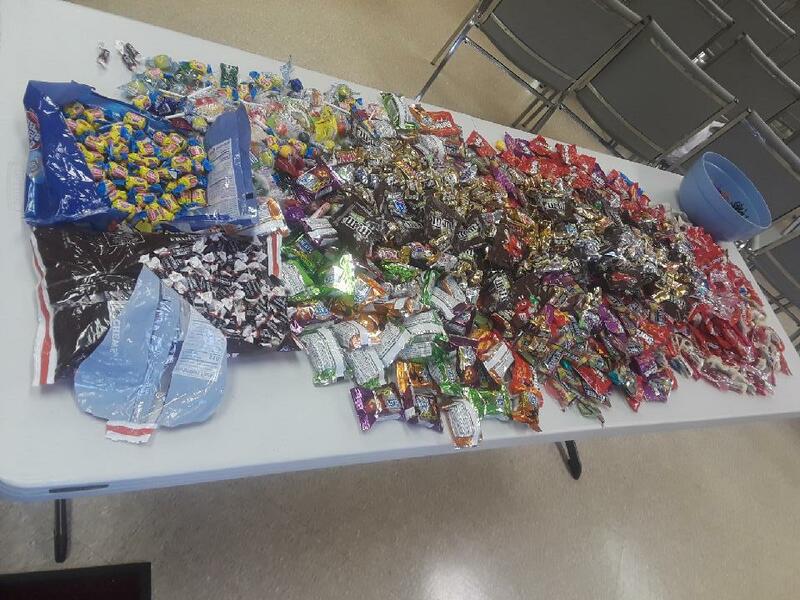 Just a reminder candy or donations are still needed to fill bags for Renaissance West STEAM Academy, by Monday 10/29. Please feel free to drop off any donations to the Local by 3pm on Monday. We will be filling bags on Monday afternoon after 3pm to take to the children on Tuesday afternoon by 3pm. If you have any questions please feel free to contact me…. I want to let everyone know that the Community Service Committee is having a meeting on September 24th (Monday) at the local lodge from 3:30-5:00pm. This meeting will be discussions on the upcoming events for the children at “Renaissance West STEAM Academy” for October and December, including fundraising efforts. Any and all members are welcomed to attend the meeting. I would like to, “Thank” everyone from the bottom of my heart for all the donations to make this project a success. The look on the faces of not only the staff, but the parent’s of the children were speechless. 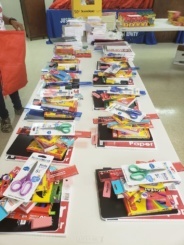 They were overjoyed with the supplies and the dedication from our local lodge to making this event a success. Here are a few photos from the event and the more can be viewed by Clicking Here. Again, Thank you brothers and sisters for all that you’ve done! 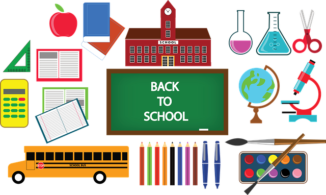 Were just about two weeks from Open House for the children at “Renaissance West STEAM Academy.” We are still looking for school supplies to fill the bags or a monetary donation can be made. We’ll start filling bags the week of Aug 20th for any member interested in helping. I’ll have times for the week at Thursday’s Noon Business Meeting. Let’s make this project a BIG SUCCESS!!! New video and photo galleries added!! This is a busy and important time for our union and especially our local. You the Members have been hard at work on a lot of projects and our lodge was honored this week with a visit from IAM GVP Sito Pantoja and other members of The Association Negotiating Committee. We’ve added two new photo galleries you need to check out! Go Here to see the incredible donations that our Local collected for the Renaissance West STEAM Academy! These donations were delivered by our own Helena Thornton and Renae Miller from the Women’s/Human Rights Committee.